Independently bottled Cragganmore is something of a rare beast. Not as rare as, say, IB Oban, but rare considering that the distillery produces at least 1.6 million liters of spirit every year. 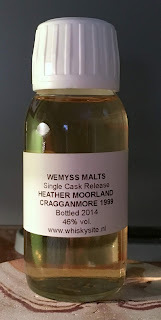 One way or another Wemyss managed to get their hands on this particular cask. Given that I recently commented to MAO that the OB 12 Year Cragganmore made me want to try it from an IB, this is good timing. This whisky was distillery in 1999, filled into a hogshead, then bottled in 2014 at 46% without coloring or chill filtration. Nose: lots of fresh malt, very floral (lavender), grass/herbs/peat without any smoke, salty, berries (raspberry), creamy vanilla. After adding a few drops of water it becomes softer and sweeter with caramel coming out, but the original notes all remain. Taste: semi-sweet malt with berries in the background up front, becomes drier from the middle back, another flash of berries and some citrus going into the finish, very little oak. After dilution it becomes sweeter throughout and a pleasant citric sourness (lemon) begins around the middle. This is a bit of an odd beast. Initially it came off as extremely youthful, without enough cask impact to smooth off any of the spirit's rough edges. Dilution handily tamed those faults and gives a much more pleasant and rounded experience. My second tasting had a much more rounded character to start with notes that I associate with Islay and other peated malts, but without any overt peat or smoke. Overall quite interesting, though I feel like the big floral notes in the finish might be off-putting for some. While I ultimately enjoyed this whisky quite a bit, I would only buy it at a fraction of its current price.